Please double check that all of your Live Fennux and Fennux Dens on “Web Market” are actually set for sale. We will be using a Blacklist that blocks “repeat offenders” from listing Fennux on the Web Market. If we get multiple reports that your Fennux are on the Web Market but not for sale, and there is no easy way for a user to actually buy your Fennux, we will be inclined to place your name on the Web Market Blacklist for as long as your Live Fennux / Fennux Dens are showing up on the Web Market but are not for sale. This includes Fennux that are “taking offers”. You are not allowed to list a Fennux to “Take Offers” on Web Market, please use another form of advertising to take offers over time. We want the Web Market to be for instant sales, or at a live auction, or at least Bid Board sales that have a set time limit. This includes Fennux listed on Web Market that are in areas that people cannot Teleport to with ease due to Security Orbs or land that doesn’t let you “TP Anywhere”, etc. This includes setting a Fennux “Contents” for sale, instead of the entire object for sale. Visit http://www.fennux.com/market/Firstname.Lastname (change Firstname and Lastname to your avatar name in SL, with a period (.) separating the first and last name. OR you can visit http://www.fennux.com/market (while you are logged in to My Fennux) and it will give you a link to click at the bottom of the page to click automatically! And make sure your Dens and Fennux are as per our policy described above. …And that’s all you need to do! If you place Fennux for “crazy high prices” just to get around this blacklist, it will be up to Team Fennux to decide if we should blacklist all of your Fennux or not, so please do not try to “cheat the system”, we get complaints daily about people’s Fennux that are on the Web Market and not for sale. Keep in mind we will not blacklist users forever! We will however blacklist users for as long as we find Web Market rules being broken. All we need is for users to obey our rules/regulations, and that’s it. Thank you for your understanding. We will give until February 14th for people to adjust their Web Market Listings accordingly. Policy amendment on 27th April 2013: To allow customers to specify background information like “Arctic DOS” or “10 Antlers in BG” or “Mother of Caution” we are also showing the name of the Den/Fennux in the web market listing. How ever you should not use this feature to display the price of the Den/Fennux like “5k Static” or “Arctic 125″ or in any other fashion which in fact is conveying the information about the price for that Den or Fennux. Violation of this part of the policy faces the same consequences stated above. We have brought back the Fennux Affiliate Program, which is a little bit different than the original one we had during Pre-Orders, so we ask that you pay close attention. We have always wanted to reward users who refer others to join The Fennux via FNX Points, and now we are finally doing just that. Whenever a new user touches one of your Fennux Affiliate Objects (A Kiosk, 1 Prim Sign, etc.) you will have a full 30 Days to earn 1 FNX Point for every L$2 that the referred user spends on Fennux Products In-World (not on Marketplace). This means if someone for example, buys a Gold Pack for L$3395, and you referred them to Fennux within 30 days of time, you will receive 1698 FNX Points in exchange – which is more than enough to buy a Hydrated Home! So to sum everything up, a referred sale within 30 days of clicking your Affiliate Objects means that you will receive 1 FNX Point for each L$2 spent by those referred users. There is not currently a limitation on how many FNX Points you may earn, so get out there and start referring users to join The Fennux now! Keep in mind you can not refer someone who already has been introduced to The Fennux before. If someone has already touched an affiliate kiosk, made a My Fennux account, used “The Fennux HUD”, purchased a starter pack before, etc – they are already in our database and considered a customer already. This only applies to new people you introduce to Fennux via them clicking on your Affiliate Objects. The full 30 Day Referral Period begins the moment they click on one of your Affiliate Objects, so long as they are not considered a Fennux Customer already in our database. TEAM FENNUX LLC RESERVES THE RIGHT TO WITHDRAW OR MODIFY THE AFFILIATE PROGRAM AT ANY TIME AND FOR ANY REASON AT THEIR OWN DISCRETION. The Fennux Wishing Well is here! And that’s all there is to it! Enjoy your LE Fennux Den, and your 12 Days of Reserve Food! WHERE IS THE WISHING WELL? The Wishing Well exists only on the Fennux Sim. We have 1 setup next to every Crafting Machine. No, these do not have LE Eyes, they have regular eyes from a starter den, very similar to Crafting – the only thing that is LE on the Fennux is the over-ride of the Fennux Coat. It’s more-or-less exactly like Crafting, except for the fact the coat will not pass. We just put up our FNX Point Vendors at 2 locations on the Fennux Main Store. They are currently showcasing: Web Market Tokens, Polar Homes, Polar Hydrated Homes, Polar Dueling Arenas, Healer Fennux, NPC Fennux, Eternal Pet Crystals and Bronze Packs. We just finalized putting the “1 Fennux for 4 Weeks” Kibble Dishes on the SL Marketplace, as well as Gold Starter Packs on the SL Marketplace. We added some great features to the My Fennux account area. We added the ability to fix your in-world cloned Live Fennux / Fennux Dens via a simple “Fix” button at the side of each Live Fennux / Fennux Den, as well as the ability to check up on “Inactive Fennux” which are any ID’s that have not pinged our database server in the past 24 hours. We still offer redelivery which serves a great purpose for certain situations, but now you won’t have to redeliver a cloned Fennux to fix it, you’ll simply have to visit the My Fennux account area, click Live Fennux or Fennux Dens, and then click Fix next to the proper Fennux that you want to resolve the clone status for. Happy New Years Fennux Enthusiasts! Visit the above link for full information about the New Years LE Fennux! We have just finished up our Breeding Information Guide! This document will help you understand what to do and what not to do with Fennux Breeding. Now, please understand we cannot let you know every little detail on what goes on, but we are fine with trying to help point our breeders to the right direction, encouraging enjoyable results. Feel free to pass this link along to all of your friends who breed Fennux! TRADING POST – SAFE “DEN FOR DEN” TRADING! We have added the ability for users to trade “1 for 1″ Fennux Dens at our “Fennux Trading Posts” in the Fennux Sim. All you need to do is rez one den inside one of the 2 glowing boxes, and have the other user rez their one den inside the remaining glowing box, then both of you click the trading platform. After you both agree and type in the confirmation ID of the Fennux Dens you are trading, the transaction will be completed, you’ll be able to successfully visit your “Redelivery Portal” in-world on Second Life to click the portal so it will provide to you the traded den from the other user – and for the other user to get your previously owned, now traded den. Make sure that any recipe piece you are going to purchase is created by “Fennux Resident”, and when you click the recipe piece while wearing your Fennux HUD, it should show a green text message on the bottom wooden HUD bar stating the recipe’s legitimacy. If you find a recipe piece that is not created by Fennux Resident – please report the object to Linden Lab via the Abuse Report feature – also create a Fennux Support Ticket explaining full details about the incident so we can ban that fraudulent user from all of our services immediately. 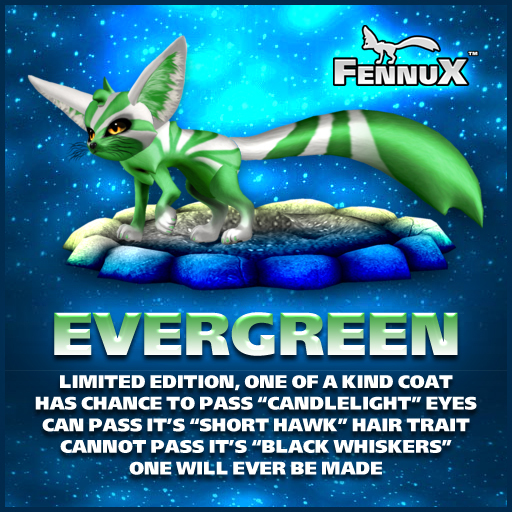 Come place a “silent bid” on the One Of A Kind “Evergreen” RFL Fennux. All proceeds benefit Relay For Life / American Cancer Society! This is the silent bidding part of the the auction, it will last until the 15th of December at 12PM SLT. At the start of Live Bidding, the highest bid on the Bid Box opens the item! If no one beats the Bid Box price, the Bid Box wins! Limited Edition, One of a Kind Coat – that will not pass. Has chance to pass the “Candlelight” eyes (similar to the RFL Winterfrost Coat). Can pass it’s “Short Hawk” hair trait, like any other traited Fennux. The whisker type can pass, but the black color tint will not pass. One will ever be made.